A Gullah-Geechee dinner at my house. 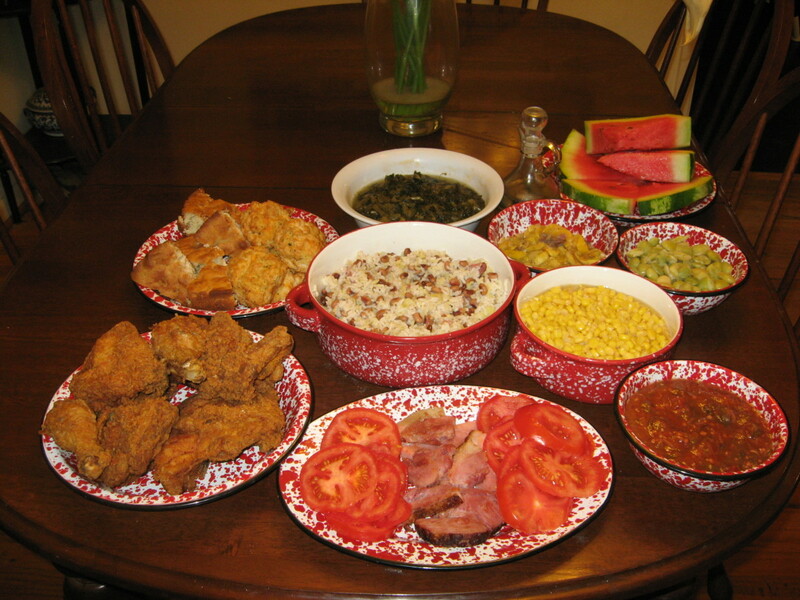 Clockwise, from top: turnip greens, pepper vinegar, squash, watermelon, lima beans, corn, okra and tomatoes, fresh tomatoes, cured ham, fried chicken, crackling bread, and biscuits. Hoppin' John is in the center. My family culinary roots are deeply embedded in Southern food and creole cuisine – more specifically, creole Gullah cuisine. I'm always preparing Gullah-Geechee recipes. Most people associate the term “Creole” only with Louisiana, but there was another important group in the southern U.S. who spoke a creole language. They inhabited the islands and coastal areas of northern Florida, Georgia, South Carolina, and southernmost North Carolina. "A black slave born in the Americas as opposed to one brought from Africa." "Any pidgin language that has become established as the native language of a speech community. A creole usually arises when speakers of one language become economically or politically dominant over speakers of another. A simplified or modified form of the dominant group's language (pidgin), used for communication between the two groups, may eventually become the native language of the less-powerful community. Examples include Gullah (derived from English), spoken in the Sea Islands of the southeastern U.S...."
This particular group of people, the Gullahs, began with Africans who were brought to America as slaves in the mid-1700s. Their language and most of their customs, traditions, and culture were heavily influenced by those of West and Central Africa, along with the West Indies. When these slaves were first brought to the U.S. coastal South, many Native Americans still occupied the region, so they also had an influence on the Gullahs, especially in the area of culinary arts. 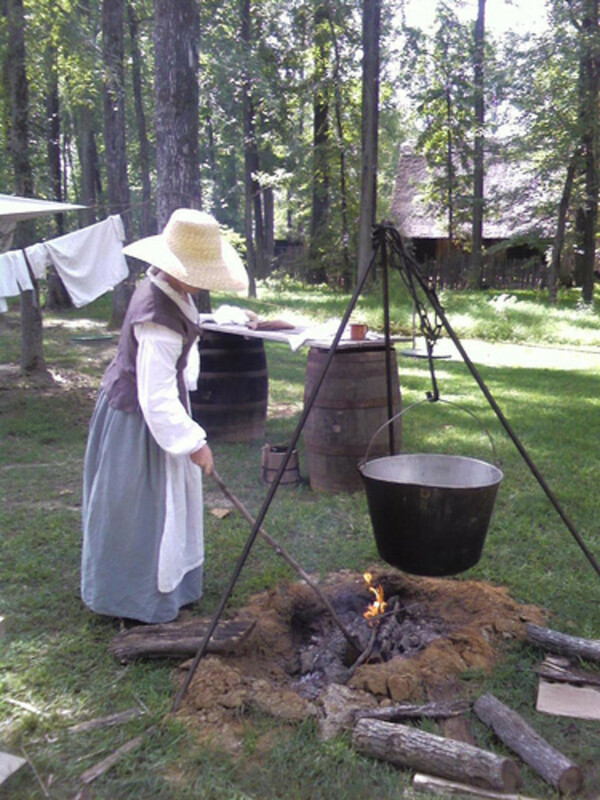 From the Native American presence, the Gullahs learned to cook dishes made of corn and cornmeal and to gather and use sassafras leaves. The name "Gullah" probably originated from Gola, an ethnic group living near the borders of Liberia and Sierra Leone in West Africa, where many of the Gullahs' ancestors had lived. Charleston and Savannah were two of the most important ports in North America for the slave trade. Some slaves were brought directly from Africa to one of these ports, while others came by way of the Caribbean or Brazil. The slaves who came from rice-growing regions in Africa were eagerly purchased for the rice plantations of Georgia and South Carolina because of their experience and knowledge. 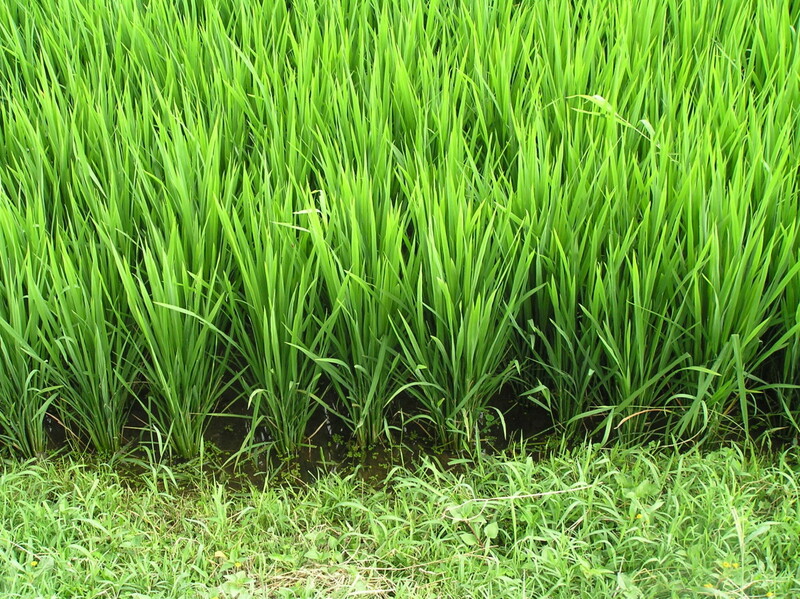 Slaves from Africa's "Rice Coast" were experts at cultivating rice. In fact, the slaves were much more knowledgeable about rice growing than their masters were. Remarkably, many of the Gullah ancestors shared their knowledge willingly with their oppressors. The rice plantation owners became wealthy with the help, sweat, and suffering of the black slaves. My great-great grandparents, the Hollemans (for whom I'm named - my middle name is Holleman; Holle for short), owned such a plantation in the Low County of South Carolina, along with many slaves. This isn’t something I’m proud of, but it is part of my family history. My great-great-grandmother Jane had a Gullah house servant who served as a cook, and my grandmother used to tell me stories about this cook and all the wonderful foods she prepared, which she had learned about from her mother. Needless to say, my grandmother’s childhood stories had an impact on her culinary skills, which have been passed down through our family. I recently found my great-grandmother’s collection of recipes, and I was overjoyed to find many Gullah dishes among them. I’ve spent countless hours pouring over the colorfully named dishes, and I’ve prepared many of them. The recipes, along with the stories my grandmother had shared, piqued my interest in the Gullah culture, so I began researching extensively. I never intended for this article to be so long, but once I got started, I couldn't seem to stop. Every time I researched a part of this puzzle, I found something else that interested me, leading to further exploration. I ended up reading numerous first-person narratives told by the slaves themselves, which really made history come alive. I also made phone calls to people on the Georgia coast who were knowledgeable about the Gullah-Geechee culture. I phoned relatives and poured over my family history, too. Unlike most other groups of slaves, the Gullah people were somewhat isolated. For the most part, they lived on remote sea islands, where few whites ventured. Because many groups of the Gullahs were left alone for long periods of time, without direct influence from whites, there was a powerful sense of family and community, and sharing food and meals with others was prevalent. Their distinctive culture flourished, with their language, folklore, farming practices, cooking techniques, and traditions being handed down from generation to generation, largely unchanged. 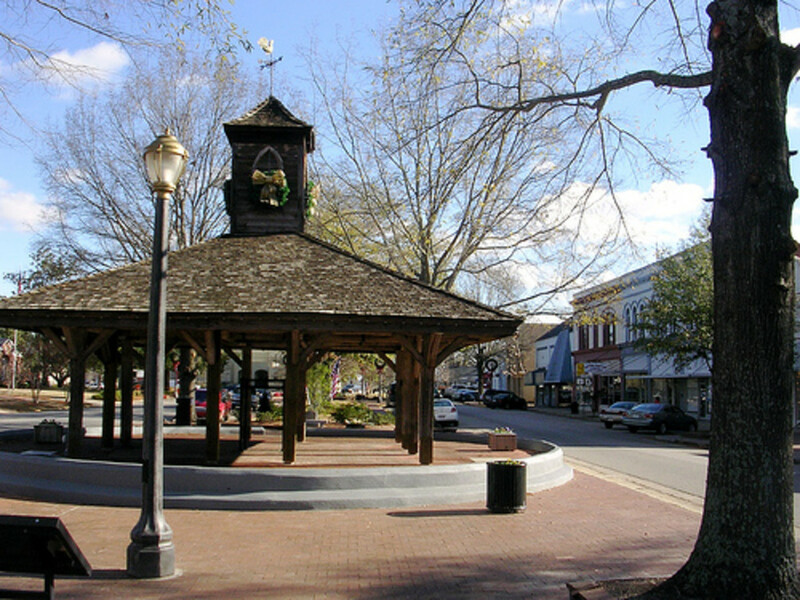 A typical Southern slave market. When the U.S. Civil War broke out, most of the coastal plantation owners fled their sprawling farms, and once again, the Gullahs were left to themselves - until a few Quaker missionaries from Pennsylvania came to the area to educate the slaves. The Gullahs were among the first slaves in the South to experience their freedom, and the missionaries built a school on South Carolina's St. Helena Island, the first in the nation for newly freed slaves. Because of the war, labor issues, and devastating hurricanes, most of the coastal plantations remained abandoned by their owners. The former slaves, however, remained behind, cut off from the outside world more than ever. Most of the plantations were divided and sold to the former slaves. Since some of the islands inhabited by the Gullahs were without bridges until the 1930s, the culture flourished untouched for decades. In general, the Gullahs handled emancipation better than most inland slaves. They were used to being left unsupervised and depending on each other, and they were adept at taking care of themselves and their close-knit community. Instead of the outside world's influencing the Gullahs, the Gullahs had a major impact on Southern cuisine - and not just on the custom of eating rice. I didn't realize just how many of the dishes I cook, along with those prepared by my mother, grandmother, and great-grandmother before me, are steeped in Gullah tradition until I was deep in my research. Foods were often cooked together in one big pot over a fire. The early Gullahs were masters of survival. They made good use of whatever foods were available, and they invented creative ways to cook and season dishes. If they lacked an ingredient for a dish, they substituted it with something else. The original Gullah slaves each received an allowance of food periodically from the plantation. This usually included rice, cornmeal, flour, salt meat or fish, molasses, peas, grits, butter, buttermilk, and sweet potatoes. At specific times of the year, other foods were added. Unlike the “gang” labor on other plantations, where slaves worked from dawn until dusk, most of the sea island plantations used a task system. Each slave was assigned a duty to complete every day, and once the job was done, the slave was free to pursue other activities. Most spent this time hunting, fishing, working in their own garden plots, or tending their own livestock. There were exceptions, however. Some of the sea island plantation owners worked their slaves all day and gave them little food. As a result, a few of the Gullahs almost starved to death. Fortunately, this was rare. Because of all the foods available for most of the sea island slaves, Gullah cuisine was rich and varied. Many of the dishes were cooked in one big pot. Meat, poultry, or fish were often cooked together with vegetables, peppers, legumes, and rice or potatoes. The original Gullahs had few items of cookware, so big iron kettles were used to their full advantage. Some foods, especially sweet potatoes and white potatoes, were often cooked in the ashes of a fire. Meats, fish, game, and poultry were also smoked or cooked over an open flame. Like the Louisiana Creoles, the Gullahs were influenced by the French, albeit to a much lesser degree. In the late 1600s, Huguenots from France and Acadians from Nova Scotia began settling along the southeastern coast from northern Florida to North Carolina - the same areas that would be occupied by the Gullah people. 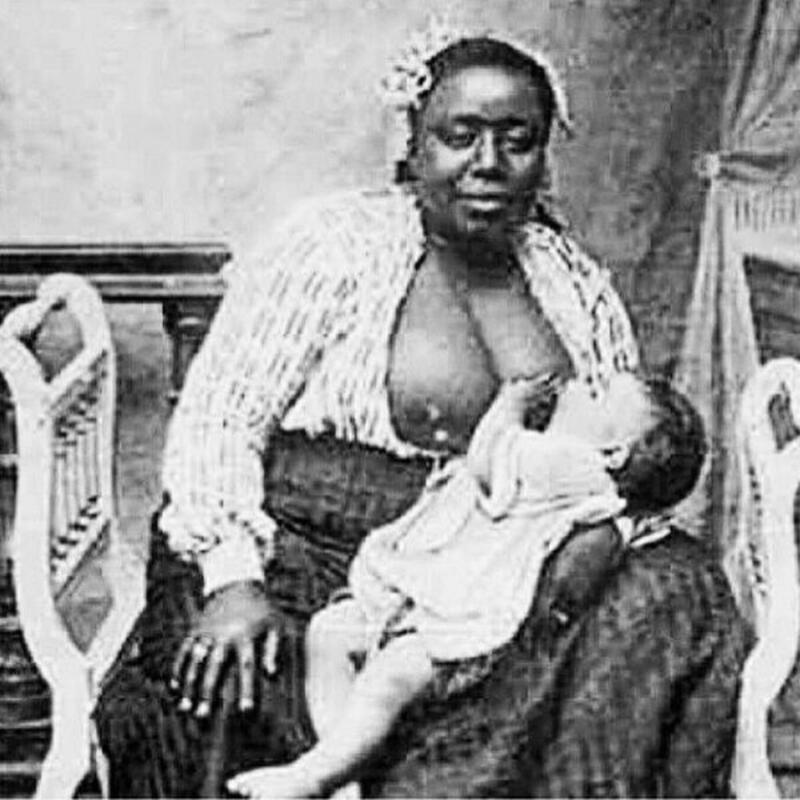 The French settlers undoubtedly had an influence on white European plantation owners. After the importation of slaves, cooking duties in the manors were assigned to the Gullahs, who followed orders from the mistress of the house, including her recipes. Needless to say, some of the French-inspired cuisine and culinary terms made their way into Gullah cooking. One example of this is "Huguenot torte," the most famous dessert of the Low Country. Another example is etouffe. Rice was the most important food for the original Gullahs. 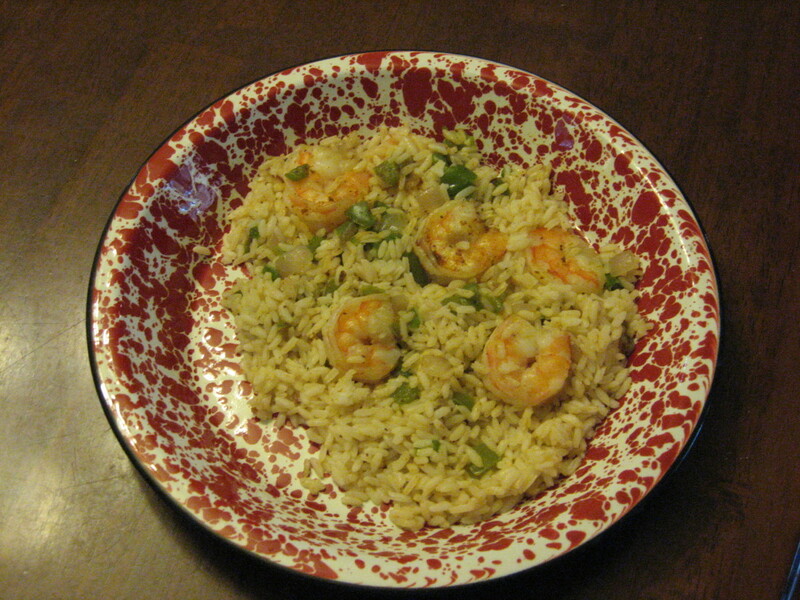 Rice was the most important staple for the original Gullah slaves. My mom told me that the first thing my great-grandmother did when she entered her kitchen to cook a meal was to put on a big pot of rice – evidence of the Gullah influence on Charlestonians and other inhabitants of the Low Country. Rice was usually eaten every day, sometimes even for breakfast, where it was often served with milk, raisins, and sweeteners like honey, cane syrup, or molasses. At dinner and supper, other foods were usually spooned over a plate of rice or mixed with rice, as in red beans and rice or peas and rice. Rice was also made into bread and into a dessert, in the form of rice pudding. Sweet potatoes, or yams, were an important staple. Sweet potatoes, often called “yams,” were another important crop of the Gullahs. 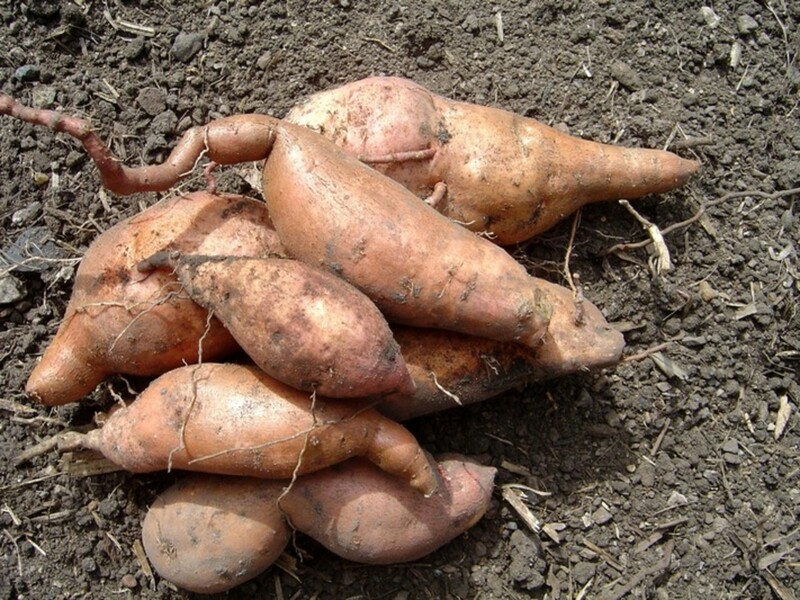 Yams, which are actually a little different than sweet potatoes, had been a staple crop in Africa for over a thousand years prior to the slave trade. The Gullahs had no problem substituting sweet potatoes for their familiar yams, and they even began to use the names for the tubers interchangeably. The sweet potatoes grew well in the long hot summers, and after they matured, they were “cured” for 10-14 days at high humidity and temperatures ranging from 80-85 degrees – perfect for Southern coastal summers. The curing process gave the tubers time for their starches to turn to sugar. After curing, the sweet potatoes were usually placed in burlap bags and stored in barns, sheds, or closets. If cured properly, the potatoes would keep until May, and by that time, several other garden vegetables would be ready to harvest. White potatoes were dug in the early summer and could be stored by packing them in dry rice or sand – both of which the Gullahs usually had a plentiful supply. Both types of tubers were added to soups and stews or baked in the ashes of the fire. Sweet potatoes were made into pones, fufu, and pies. Different types of seafood supplemented the diet. Mmmm...shrimp from the Georgia coast! Because the Gullahs lived along the coast and on barrier islands, seafood was plentiful and made up a large part of the diet. Dishes were often created from fish, shrimp, crab, mussels, clams, turtles, and oysters, and nothing was wasted. For example, a stew was made from the fish heads that were left over after the day’s catch had been cleaned. Finned fishes inshore and near shore were available year round. Some of the species caught and eaten included flounder, redfish, weakfish, black drum, whiting, spots, sea trout, pompano, spadefish, sheepshead, bluefish, catfish, shark, and Spanish mackerel. In the fall months, mullet were caught at night with large nets, and in the early spring, shad were thick in the rivers. Most fresh fish were dredged in cornmeal and fried in hog lard; sometimes they were soaked in buttermilk first. 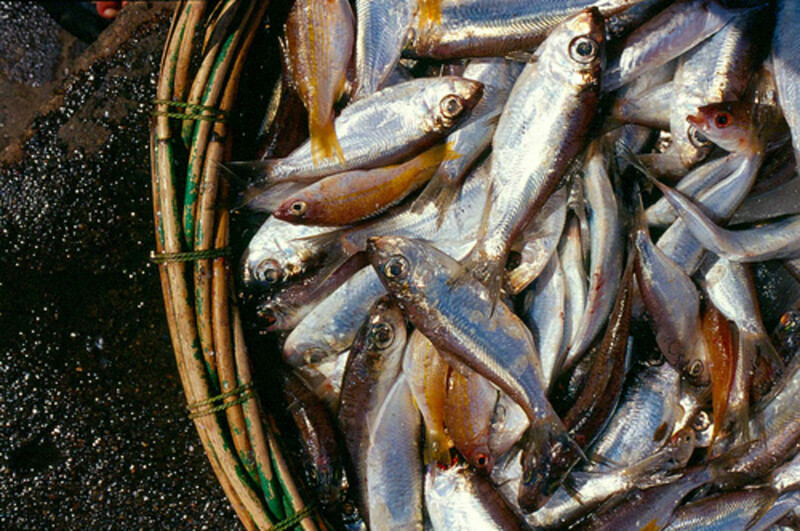 Many species of fishes were salted down or smoked to preserve them. Eels, alligators, and turtle eggs were also consumed. Crabs were usually caught in traps or lifted from the water with a dip net after being lured by a chicken neck tied to a string. The crabs were boiled, and the meat was "picked" and made into dishes like crab cakes, stews, and soups. Fish were netted with cast nets woven in a West African pattern. Homemade poles and hooks were also used for finned fishes, but the Gullahs were artists with cast nets, and they could catch fish much more quickly in this manner, without having to use bait. Cast nets with a small mesh were used to catch shrimp. 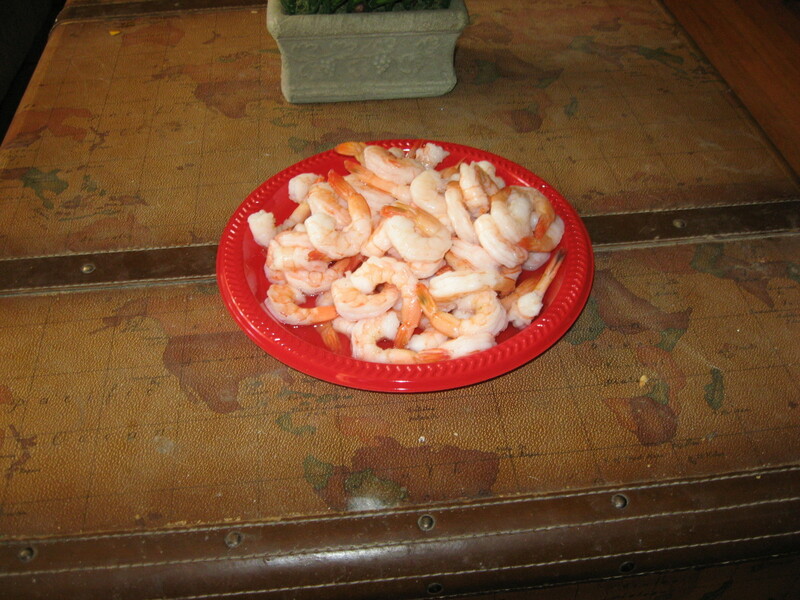 The shrimp were eaten fried, boiled with corn and potatoes, or cooked with rice or grits. Clams were dug from the shallows of coastal rivers and along the beaches. Oysters were “picked” at low tide from the numerous beds and were usually eaten only in the cooler months. The clams and oysters were usually dredged in cornmeal and fried in fat, made into a stew, or roasted in the shell over a fire. Oyster and clam shells were often cleaned and used as spoons. 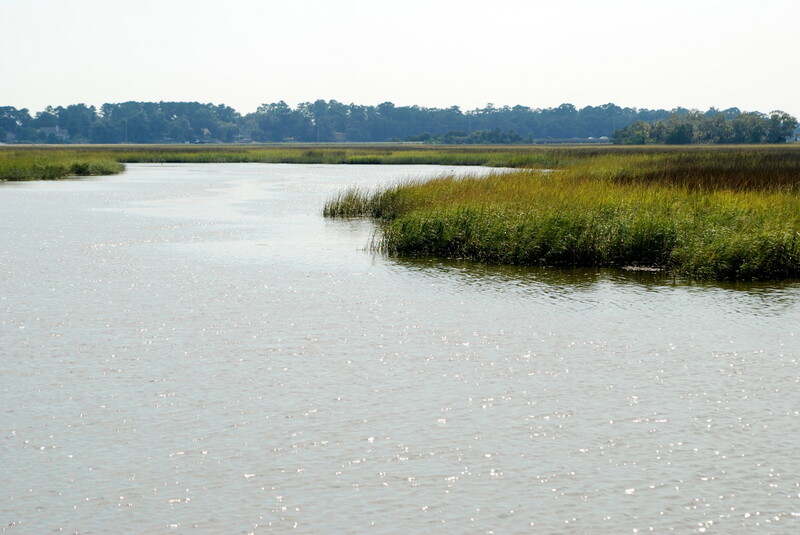 Tidal creeks and marshes held waterfowl, wildlife, and fish. 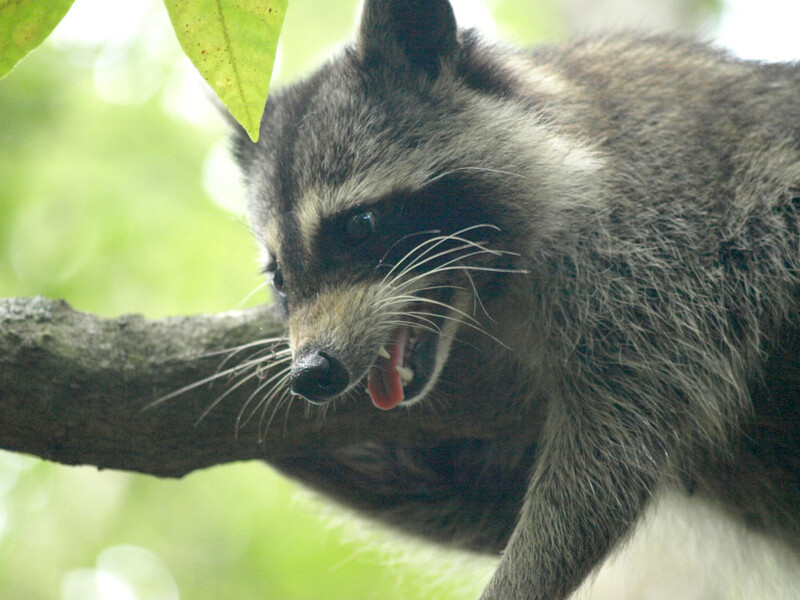 Raccoons and other wild game were hunted and trapped. Most plantation Gullahs fished, trapped, or hunted in their spare time to supplement the family’s diet. The local woods held rabbits, wild turkeys, squirrels, opossums, raccoons, quail, doves, woodcock, and the occasional deer, while the marshes and wetlands were sources for ducks, geese, and other waterfowl. 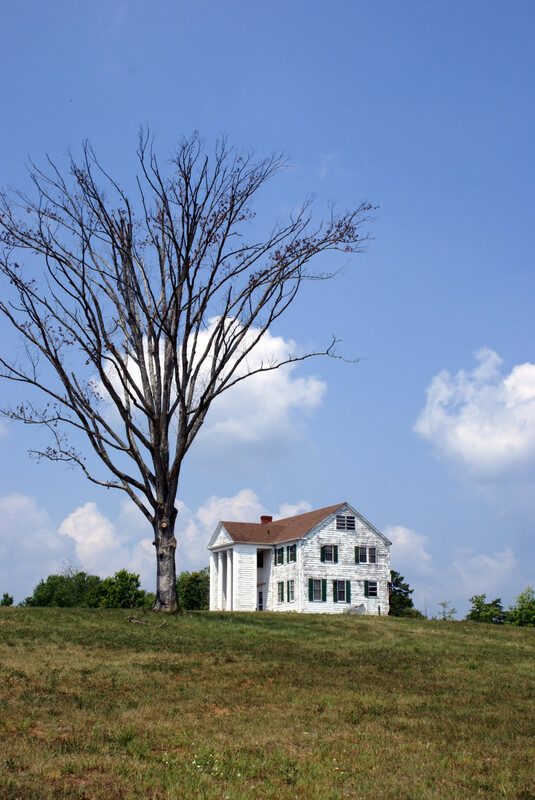 Some slaves were allowed to borrow firearms from the "big house," and a few marksmen owned their own guns as part of their job procuring game for the plantation. Gullahs who didn't have guns set snares and other kinds of traps. 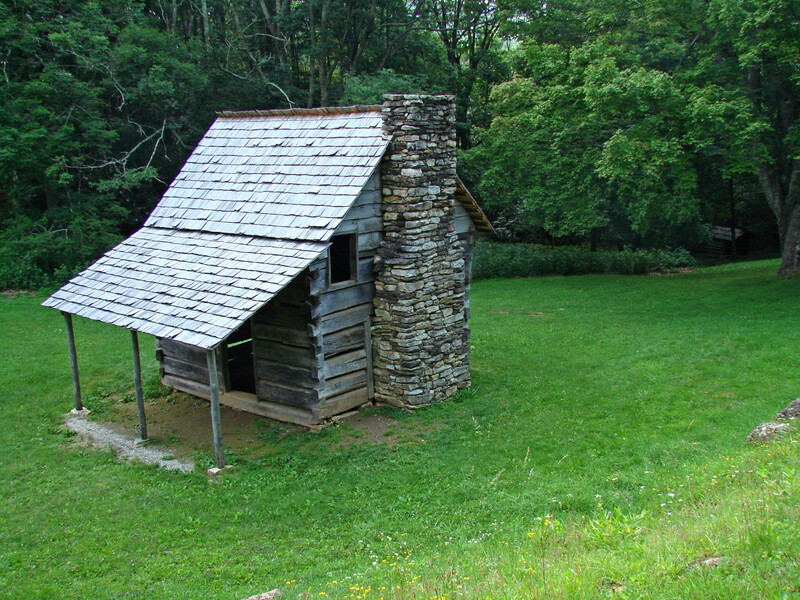 Rabbits, squirrels, woodcock, dove, and quail were usually fried or cooked on a spit over the fire, while raccoons, ducks, and geese were usually baked or barbecued. To learn to fry quail, watch the video below. 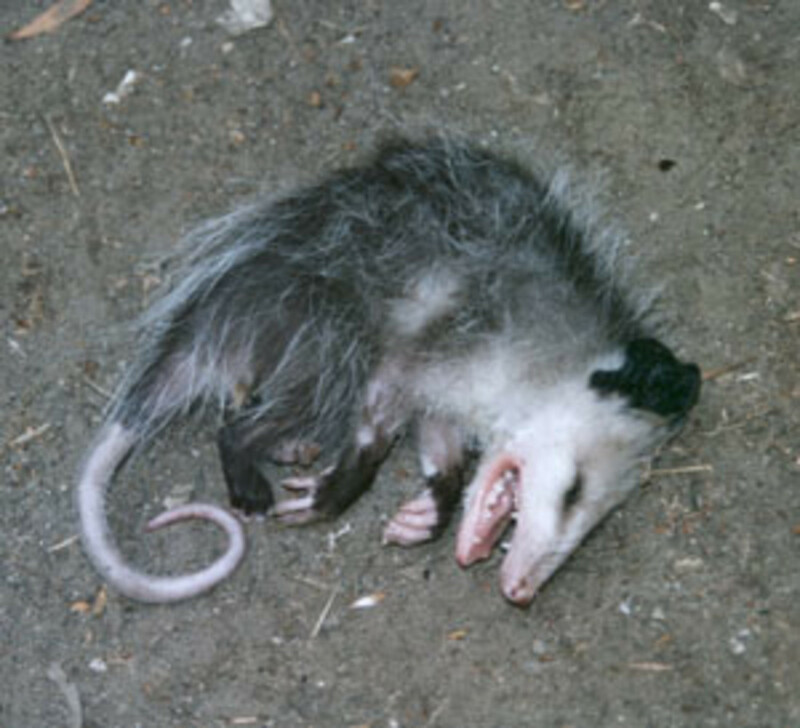 Opossums were often trapped alive and kept penned for several weeks, during which time they were fed a diet of corn and clean water. Opossums are scavengers and largely survive from carrion in the wild, so feeding them corn vastly improves the taste of the meat. Dressed opossums were often baked with sweet potatoes. Deer were butchered much the same as cattle and hogs. The loins were usually batter-fried and served with gravy, while the shoulders and hams were usually baked or smoked. In the winter months, the woodland animals had thick coats, which were fairly valuable when cured. Even the meat of animals trapped for their fur was not wasted. Several accounts tell of the Gullahs' eating fox meat. The Gullah males were proficient hunters and trappers, often trading surplus game and furs to plantation owners and other whites for molasses, sugar, flour, or other food items. Most of the pork was cured. Much of the pork the Gullahs procured were the leftovers from pigs the plantation owners had slaughtered. These consisted largely of the feet, ears, liver, stomach, jowls, spare ribs, and the intestines, which are called “chitterlings,” or “chitlins.” The feet were often brined or pickled, and intestines were cleaned, stripped, and boiled or fried. Hog killing was usually done in the late fall or winter, when the weather was cold enough to prevent spoilage. Some of the Gullah people had a few hogs of their own. The animals were cheap to feed, as they were able to turn food scraps, acorns, roots, and garden refuse into high-protein meat. 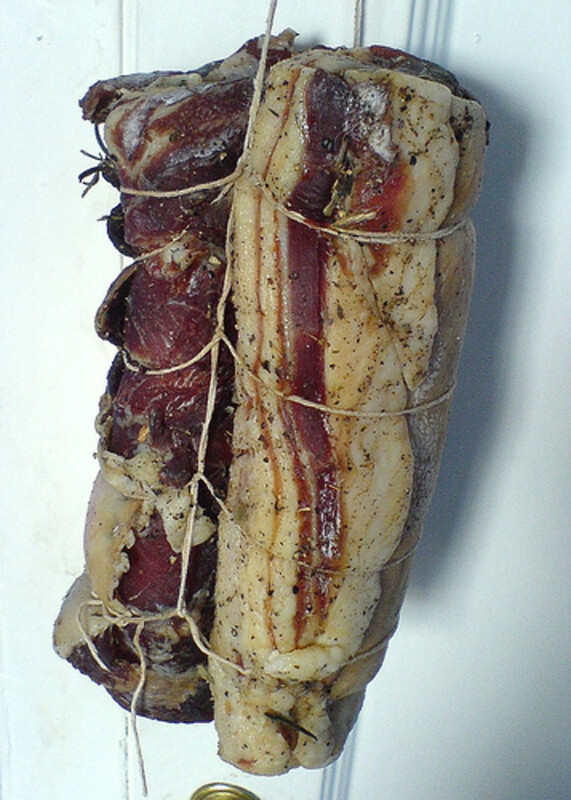 Much of the pork was cured. Hams, shoulders, and hocks were salted down and smoked over a slow fire in smokehouses. Bacon was made from cured pig bellies and side meat. Salt-cured pork would keep a long time without refrigeration. The neckbones, pork chops, and ribs were usually eaten fresh. Neckbones and rice was a popular dish, as was smothered pork chops. Ribs were grilled over a fire or dredged in flour and fried in a skillet. The scraps from the hog carcasses were usually chopped finely or ground, mixed with spices, and stuffed into pig intestines for sausage. Most of the sausages were smoked, but some were eaten fresh. Pigs had another important role, too. Lard was rendered from their fat and was an important ingredient for frying and baking. Many of the early Gullahs kept chickens. They were cheap to feed and were a constant source of eggs and meat. The birds would be ready to eat in less than three months after hatching. The females were often kept for laying eggs, while most of the young cockerels were grilled, baked, or fried. The practice of deep-frying chicken parts in hot oil was prevalent in West Africa, so this was nothing new for the Gullahs. The chicken feet were usually boiled with rice. 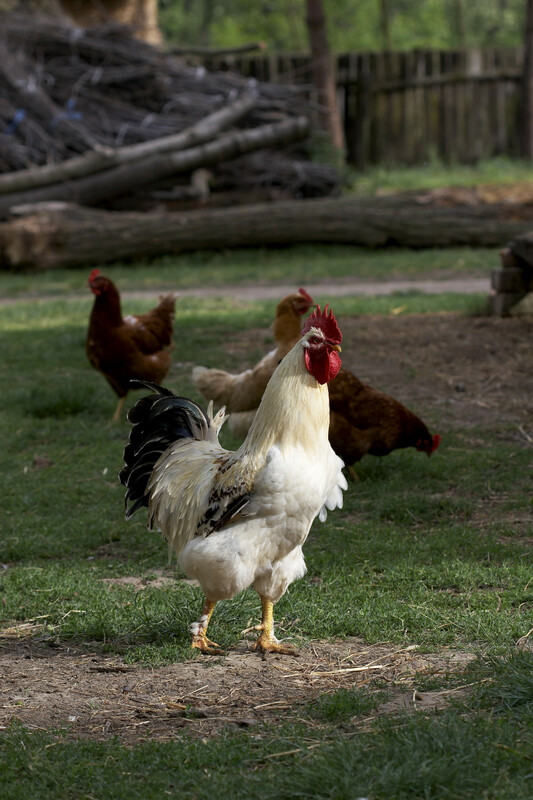 A hen might lay as many as 300 eggs a year. Once her egg production sharply decreased, after the age of about 12-18 months, the hen was slaughtered and eaten. 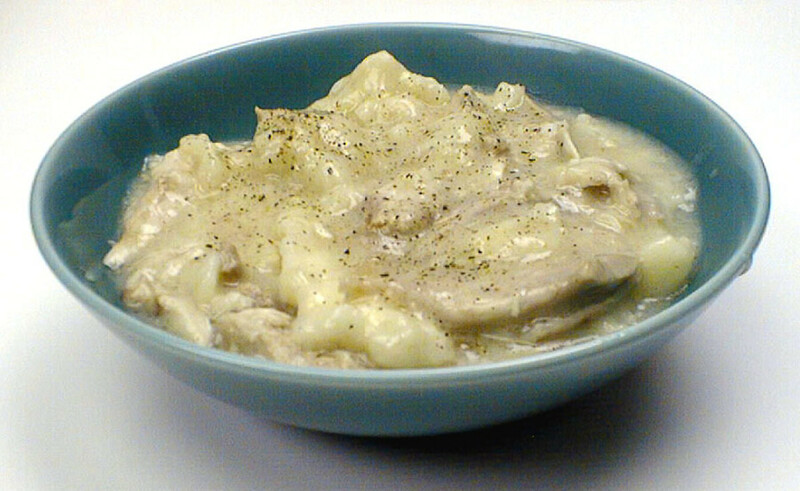 Since the meat was tougher than that of a young chicken, the "spent layers" were often stewed, slow-cooked, or used in soups. A wide variety of vegetables was available in the summer. With the long growing seasons in coastal Florida, Georgia, and South Carolina, summer crops were readily available for several months. Yellow squash, tomatoes, butter beans, eggplant, green beans, peppers, and okra were popular in Gullah Gullah cuisine. Summer squashes were often stewed with onions, while tomatoes were eaten raw, made into sauces, and cooked in stews and soups. 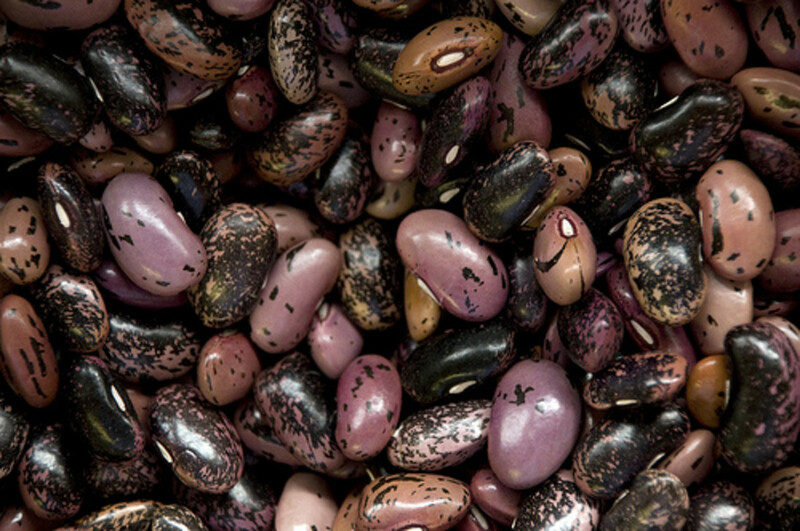 Fresh beans were usually boiled with ham hocks, while eggplant was baked, fried, or stewed. Green tomatoes were sometimes sliced, battered with cornmeal, and fried in hot lard. Peppers added flavor to a wide variety of dishes. Okra was one of the most important foods in the Gullah culinary culture. The West African name for okra is okingumbo, from which the popular dish "gumbo" gets its name. Some of the most popular okra dishes, in addition to gumbo, were fried okra, okra and tomatoes, and okra soup. Okra was also used as a thickening agent. 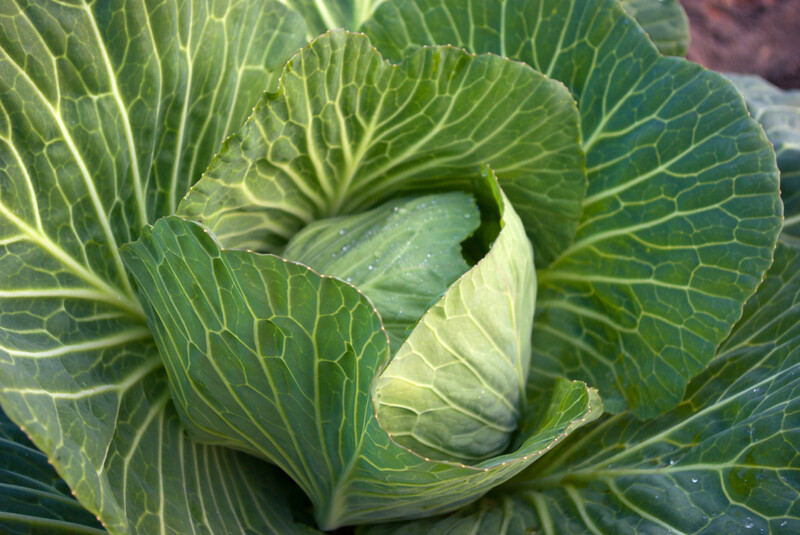 Cabbage and other cool weather crops could be grown in the fall and the early spring. Because of the South’s mild climate, several vegetables can be planted for spring and fall harvests. The most popular cool weather crops with the Gullahs were cabbage, onions, garden peas, carrots, celery, and different types of lettuces and greens. Cabbage and green onions were often grown through the winter because they can withstand temperatures as low as 20 degrees, and in much of Gullah country, the temperature rarely dropped that low. Collards, mustard greens, and turnips, which were used for their roots as well as for their greens, will survive a light frost, so they were also popular fall crops. Peas and carrots were often boiled together, and onions and celery were used to season a wide range of dishes. 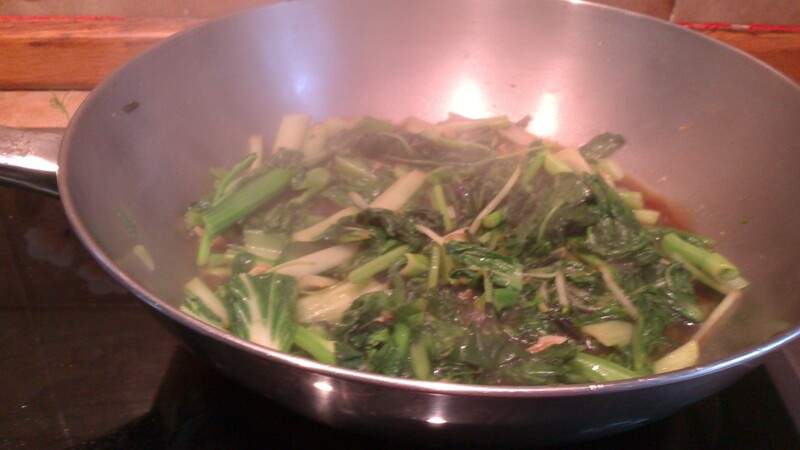 Greens and cabbage were seasoned with bacon grease or bits of cured pork and boiled in a large pot. Dried beans provided protein when meat was scarce. Dry beans had been grown in Africa for hundreds of years before the first slave was forced onto a ship. Undoubtedly, the Gullahs already knew how to grow, store, and cook dried beans before they arrived in the New World. According to my great-grandmother, many of the produce farmers and plantation owners would share their bounty with the local Gullahs. After beans had been harvested, those missed by the gleaners were left on the vines to mature and dry. The Gullahs and poor whites would be allowed to gather the dried beans, which could be successfully stored for months without need of refrigeration. The legumes gave the Gullahs a protein source when meat was scarce. Lima beans were a favorite, and they were often cooked for hours in a wash pot outdoors while the women were doing their weekly laundry. The limas were flavored with chunks of cured pork, onions, and peppers, then cooked down until the starches in the beans made a thick gravy. Other types of dried beans were often cooked with rice. The mixture was seasoned with sausage, ham, peppers, herbs, and spices, according to the cook’s personal preferences. Peanuts were another legume that figured prominently in Gullah cuisine, as they had been grown in West Africa and were a favorite with the Gullah people. 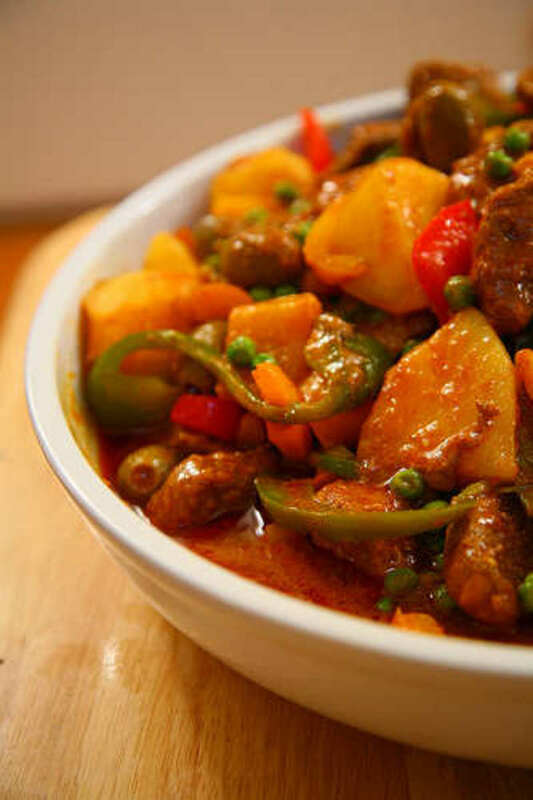 The food had been introduced to Africa in the 1500s by Portuguese traders. Peanuts were often boiled in large pots over the fire or made into a paste and mixed with chicken stock and tomatoes to create a sauce. Dried corn was ground into meal at a grist mill. 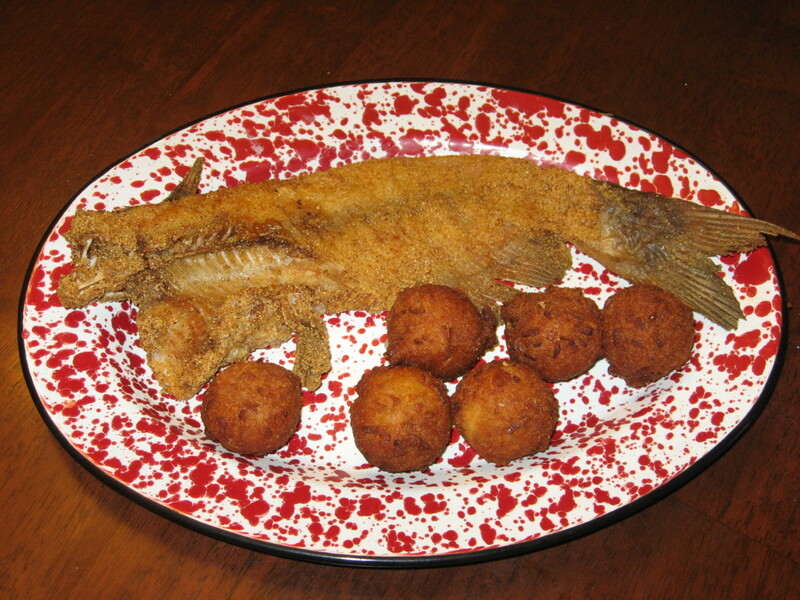 My "fried catfish and buttermilk hushpuppies." Although flour was available, it wasn’t usually locally grown, so most of the breads were made from cornmeal – dried corn that had been ground or chopped into a coarse powder. This could be done manually, but most often the corn was taken to a grist mill for processing. 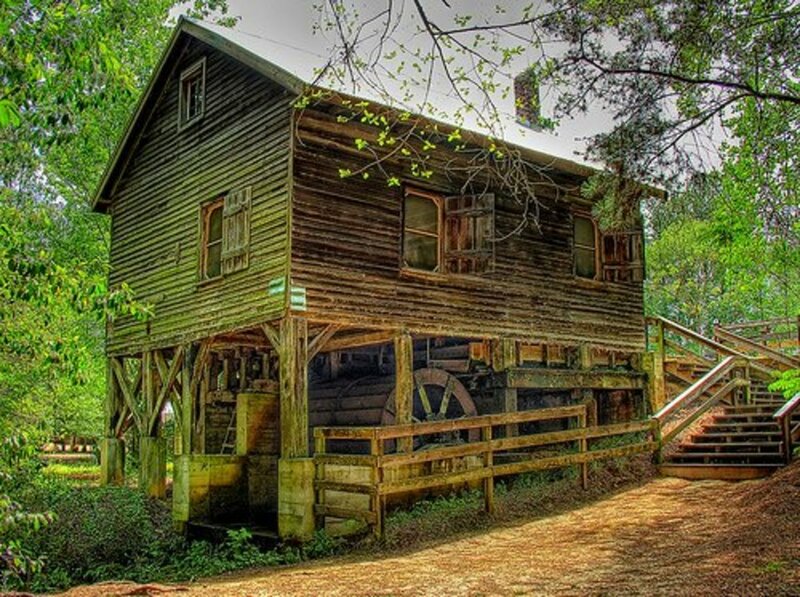 Many large plantations had their own grist mill. Cornmeal was turned into cornmeal mush, muffins, corn pones, and cornbread. The cornbread could be baked in an iron skillet or fried by spoonfuls. Sometimes leftover cornbread was mixed with chicken stock, onions, and celery for "dressing." Another popular dish was crackling bread – cornbread that contained bits of pig skin and fat from rendering lard. Grits were another important staple. Corn was dried, soaked in lye, and rinsed to make hominy. The hominy was then dried and ground into grits. Grits were eaten for breakfast and often accompanied shrimp or fish at other meals. This practice is still common in the Deep South. Flour was usually reserved for biscuits, pie crusts, cobblers, and dumplings. Fresh corn was often boiled on the cob. Sometimes the niblets were scraped from the cob and made into fritters or added to stews. 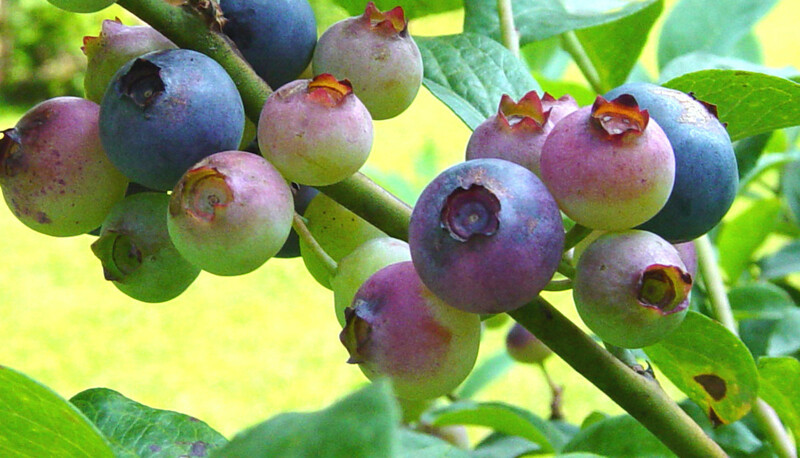 Wild blueberries were often baked into pies and cobblers. The favorite among the fresh fruits with the Gullahs was the watermelon. Watermelons had been grown in Africa for almost 4,000 years, so they were familiar to the slaves. Mayhaws, small fruits that grew along creeks and in marshy areas, were picked in May and made into jelly. The peaches, blackberries, pears, apples, and blueberries were often baked into pies and cobblers, and sometimes the grapes were dried into raisins. Even the skins of the grapes were saved and made into pies. The plantations kept a few dairy cows. Most plantations had their own "milk cows," so fresh milk and buttermilk were available in the winter but spoiled quickly in the warmer months. Any type of cheese was pretty rare. The most common dairy product was clabber, which was often eaten with breakfast, sweetened with molasses and flavored with nutmeg. To make butter, the cream was skimmed from the top of a pail of milk and allowed to clabber. The clabber was then placed in a wooden or pottery churn and agitated with a "dasher" attached to a wooden handle. Slave children were often assigned this tedious task, and they would usually sing or chant to maintain a rhythm for churning. Butter would slowly accumulate into flecks. The mixture in the churn was then strained, and the solids were creamed together as butter, while the remaining liquid was referred to as "buttermilk." It was extremely rare for a slave to own cattle. 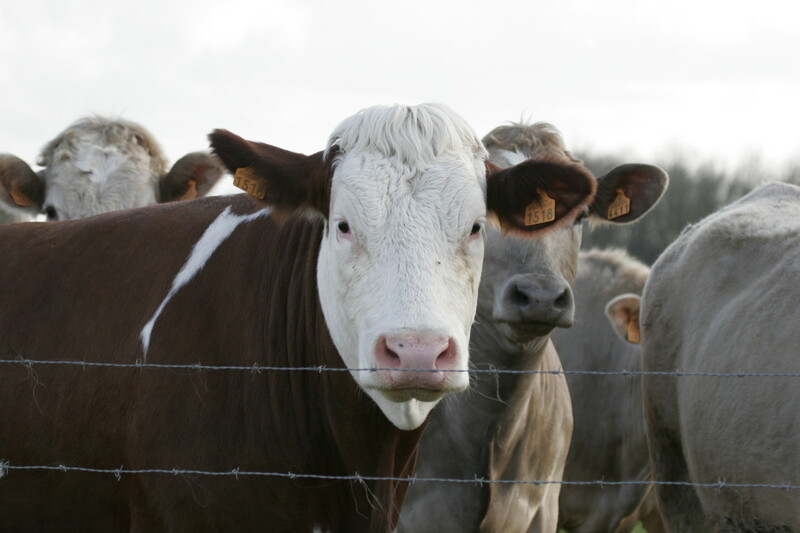 Unlike pigs, cows are expensive to feed and are slow to mature. Also, they require a large amount of grazing land, which of course, the original Gullahs lacked. Many plantations raised beef cattle, but the meat was largely reserved for the plantation owner and his family, or the live animals were sold to the beef market. Typically, when a steer was butchered, the only parts that might go to the slaves were the tongue and the tail, which was referred to as "oxtail." The tongue was often smoked or boiled, and oxtails were usually sliced into small segments. Because they're tough, bony, and cartilagenous, they were usually braised or stewed for several hours in order to make them palatable. Sometimes they were made into a soup with rice, vegetables, and/or potatoes. A tea was made from sassafras leaves and roots. By far, the most common drink was water, which was sometimes sweetened with sugar, molasses, or honey. Sometimes a drink was made by adding roasted okra to water, along with a sweetener. A few generous plantation owners might include a little coffee in the slave rations, but this was fairly rare. On special occasions, especially Christmas, the plantation owner might dispense small amounts of rum, whiskey, or wine to the slaves. 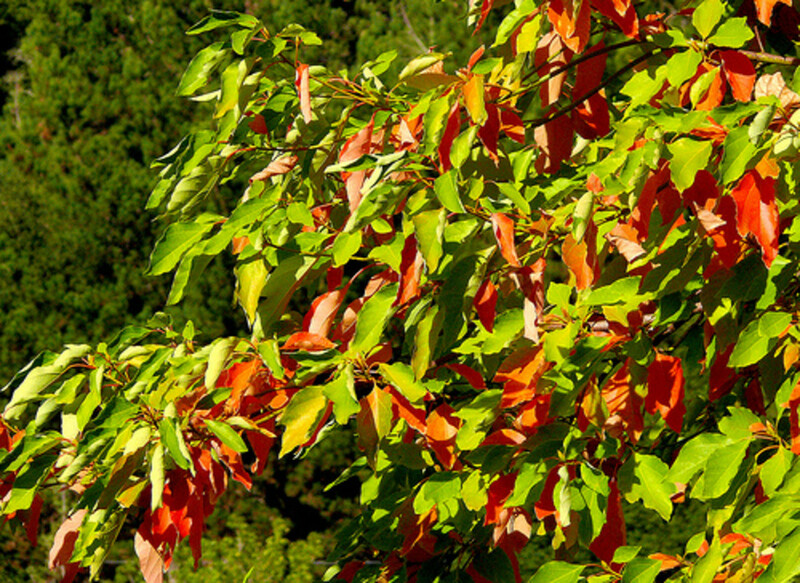 Sassafras, which has a rootbeer-like flavor, could be found growing in the woods and was a popular ingredient for making teas. Both the roots and leaves of the wild plants were used. Bell pepper, onion, and celery were used in many dishes. The Gullahs, like the Louisiana Creoles, held the “holy trinity” of cooking in high esteem. This trio consists of onion, celery, and bell pepper. 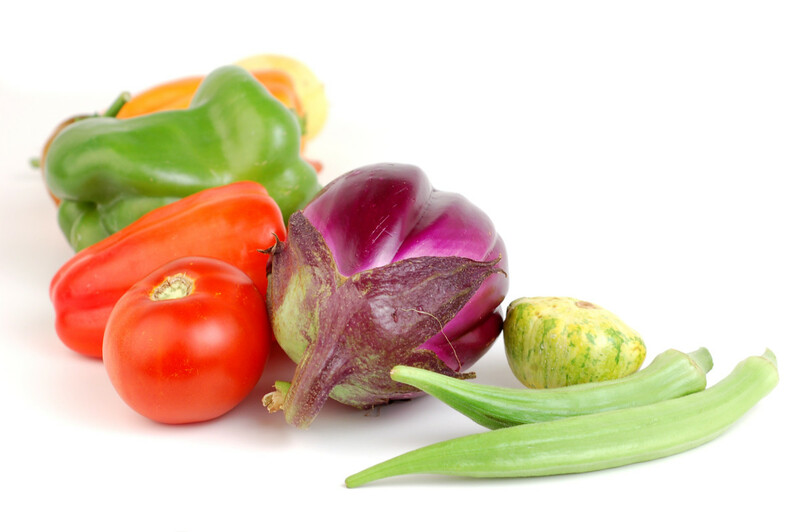 Any color of bell pepper can be used, but green and red were the most common among the Gullahs. 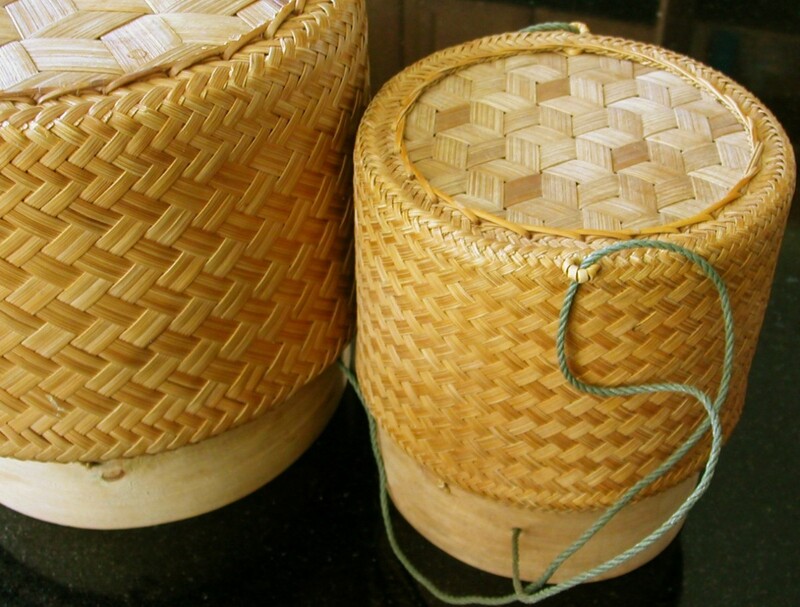 The culinary trinity was used to season many dishes, giving food a distinctive Creole taste. Molasses was a common sweetener. The Gullahs used a wide range of herbs, spices, and other seasonings, in addition to the ever-present trinity. Among the most popular were sesame seeds, nutmeg, basil, savory, thyme, parsley, cayenne, garlic, and black pepper. Another important seasoning was learned from Native Americans: file powder. To make file, sassafras leaves were dried and ground. In addition to adding flavor, file was also used to thicken soups, stews, and sauces. Many of the slaves produced their own salt from boiling down seawater. Salt was also usually included in the monthly food allowances from the plantation masters, but it was often in short supply. Also included in the usual food allowances were sugar, molasses, and honey. Industrious Gullahs might find more honey from wild hives in nearby woods. In the fall, cane syrup was made. Stalks of sugar cane were fed into a mule-powered "grinder" that squeezed the juice from the cane. The juice was then boiled down into a syrup. Frogmore stew is a common Gullah Gullah dish. Benne – sesame seeds. The seeds were made into cookies and candies and were believed to bring good luck. The seeds had arrived with the slaves in necklaces and were planted near the cabins or in the gardens. Brunswick stew – a mixture of corn, tomatoes, onions, rice, lima beans, potatoes, and chicken, pork, ground beef, and/or squirrel and other small game. 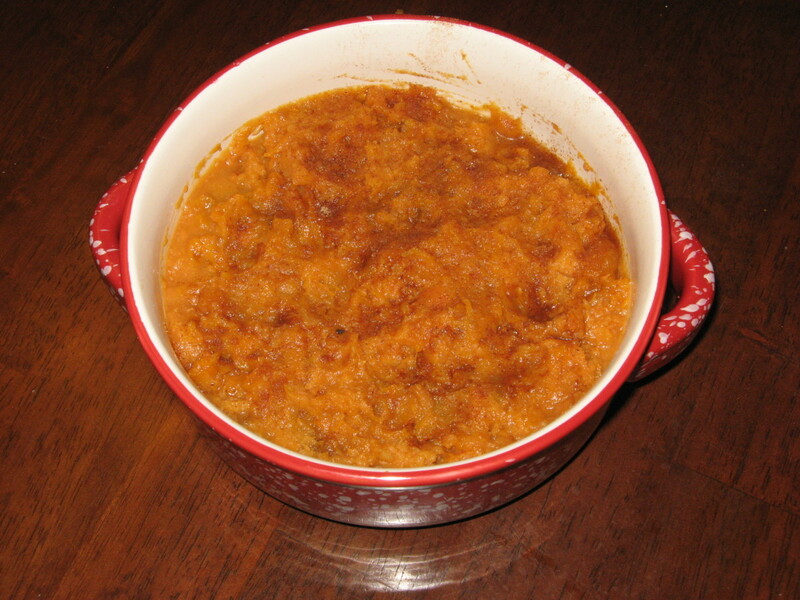 The term “Brunswick stew” was not used widely in the Gullah region until the late nineteenth century. Food historians disagree as to the name’s origin, but most Georgians are convinced it originated in Brunswick, on the Georgia coast. A big iron wash pot and plaque in Brunswick, Georgia commemorate the first batch supposedly ever made. 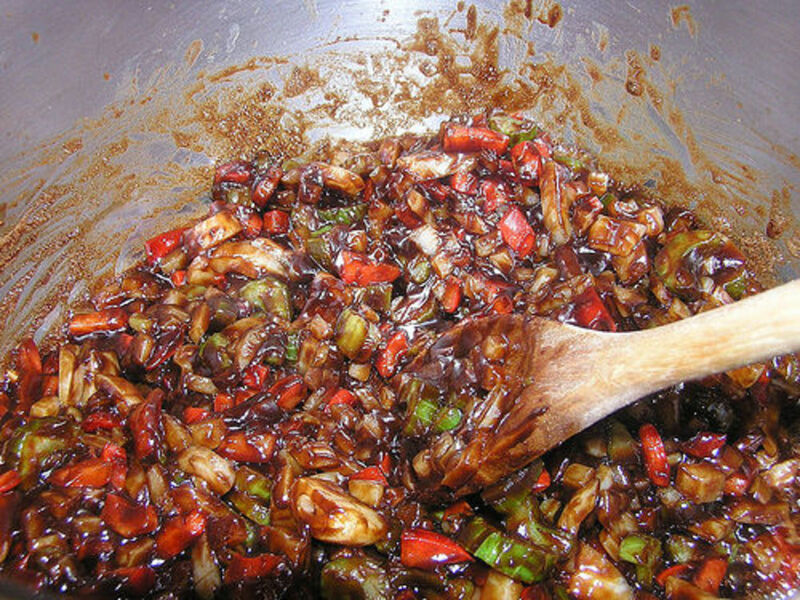 Chow chow – a sweet, hot relish made of vegetables, peppers, vinegar, and sugar. This was a way to use and preserve late-season vegetables that might remain in the garden. When there weren’t enough of one type for a “mess,” the odds and ends were harvested for chow chow. The first mention of “chow chow” relish was in an eighteenth-century South Carolina cookbook. It was often eaten with dried beans and cornbread. 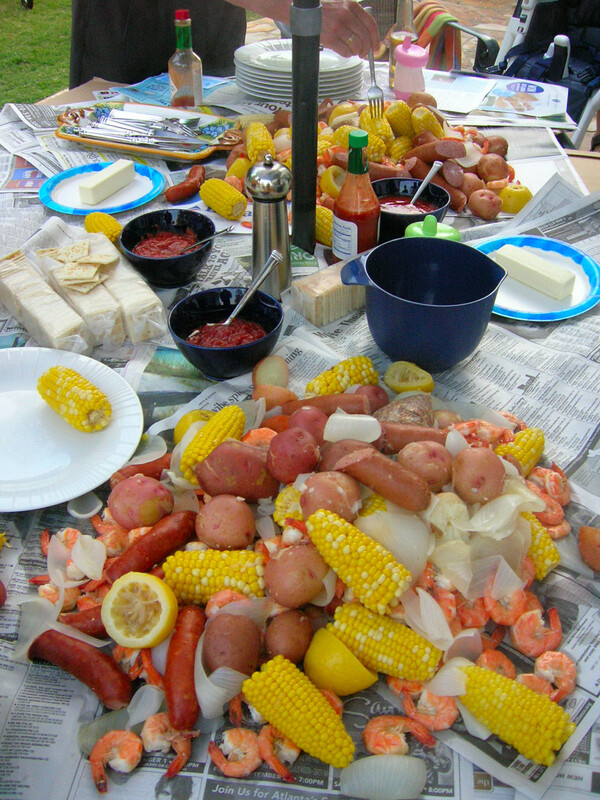 Frogmore stew – shrimp, sausage, corn-on-the-cob, spices, and potatoes, all boiled together. Sometimes crabs and clams were included. Jumble cakes – small sweet cakes. The dough was rolled into small ropes and formed into circles, then baked. Pot likker – the liquid left over from a pot of greens. This was “sopped” with cornbread. The original Gullahs weren't too concerned with healthy cooking techniques. They were more concerned with survival and taste. Cooking and eating were among the few pleasures they had. They didn't really have to worry about calories, anyway, because they did so much manual labor. Unfortunately, most of us do have to be concerned about such things because compared to the Gullah slaves, we follow a sedentary lifestyle. 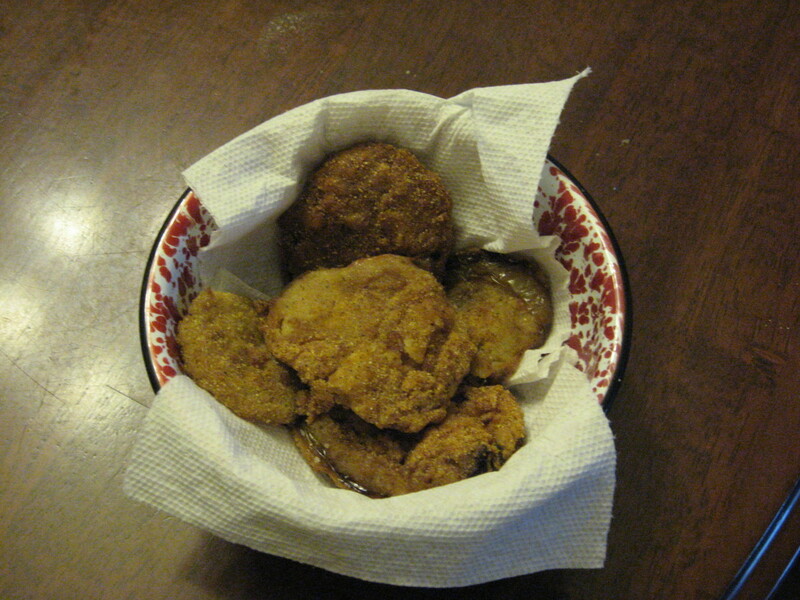 There are several ways, however, to make traditional Gullah foods healthier. Instead of seasoning vegetables with cured pork, use smoked turkey. Chicken and beef bouillon also add a lot of flavor to vegetables. To get a "smoky" taste without adding meat, use a few drops of Liquid Smoke flavoring. Use a light oil for frying and sauteing instead of lard or bacon grease. A reduced-fat margarine can be substituted for butter, and fat-free buttermilk can take the place of whole buttermilk. 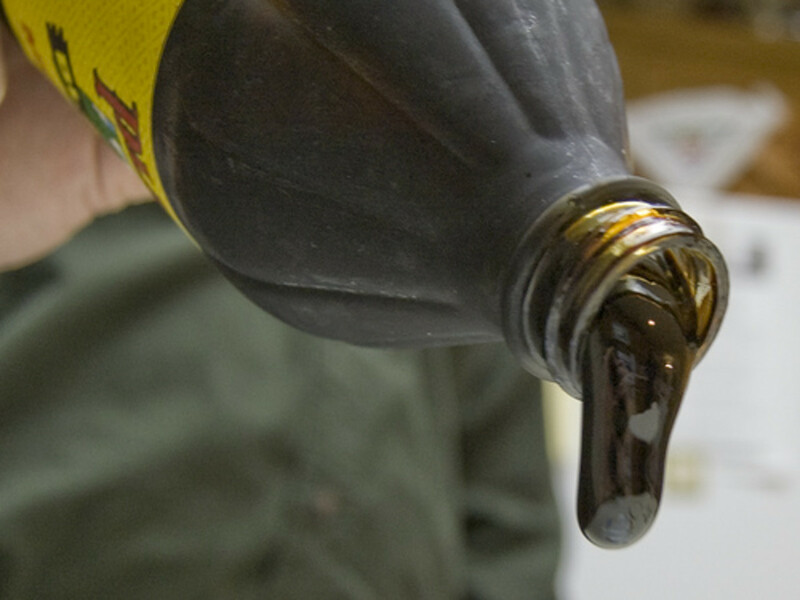 Splenda can be used instead of sugar, and sugar-free syrup can be substituted for cane syrup and molasses. Use low-fat seasonings to add flavor to rice: bouillon, stewed tomatoes, onions, garlic, peppers, and herbs. You won't miss the fat! Fried chicken is a Gullah favorite, and it's traditionally fried in lard. For a healthier recipe that includes a crunchy high-fiber coating, check out the video recipe below. Admittedly, some of the lower-calorie and reduced-fat results won't be as tasty as the original recipes, but you'll still get the basic flavors that are traditional Gullah. Every once in a while, however, indulge in some real Gullah grub! Although the Gullah once inhabited the Atlantic coast from Florida to North Carolina, most of the population is now limited to a few South Carolina and Georgia islands, including Sapelo, Daufuskie, and St. Helena. They’re struggling to keep their colorful heritage alive in the modern world. Developers have long had their eyes on the ancestral lands of the Gullahs on the beautiful isles, but most of the inhabitants refuse to sell, at any price. Gullah Gullah cuisine has a dedicated following, and the number of fans is increasing. In fact, several restaurants along the Southern coast feature the distinctly flavored dishes, and a few of the eateries serve nothing but Gullah cuisine. Gullah cookbooks are also available. Gullah heritage centers and festivals are also helping to educate people about this fascinating group of people. If you ever have the opportunity to attend one of the colorful events, come hungry. You’ll want to sample as many Gullah foods as you can! Wow this has so much info! I feel like I learned a lot from this article. Thanks for taking the time to write this. Very well written. Hello, I just want to say that I am not sure why you think that the Gullah Geechee isn't alive and present in Florida but I am from Florida and I am very much in tune with my fellow GullahGeechee people. Thanks for writing such an interesting and informative article , as well as the very interesting videos. I am from the Caribbean , a very small island. I can remember as a girl speaking and hearing , what we called pidgen english , but after reading this site , and thinking about some of the words we used and still do , that call broken english , I am wondering if my ancestors were of the gullah. Yes we had slaves from africa on the island . Any way again thanks for writing this article /page. I do wish that this information be taught in the schools , instead of hidden as though never were. Tanks fo de info ... me lern lots tday . Really interesting hub with so much information. An awesome hub. I learned a lot! Thanks. that was lots of hard work......well written, awesome clicks. I feel the page part very interesting. thanks!! What a wonderfully informative article! I was raised in Texas til about the age of 15. My mother's family was from Georgia and it was not uncommon to have leftover rice served as hot cereal with brown sugar for breakfast. The parts about the language were very interesting. Thanks for a wonderful and informative site. I came to it by looking for a Hoppin John recipe, but came away with a wealth of understanding about the culture in early days in the South. I am from Georgia, but other family was from South Carolina. I'm sorry to say that some kept slaves, but have no control over what they did. Your description of how they lived was an eye-opener for me. Thank you so much for caring enough to go the extra mile with your research. Jean, I'm so glad you enjoyed the read! Thanks! THANK YOU for such a wonderful history lesson, and the sharing of your family history! Definitely worth a second..or third read and look-see habee. You really did put your heart and skills to work on the Gullah foods, recipes and history here. Out-standing Hub. Dr. Rock, I'm so glad you enjoyed it! Alastar, thanks so much! I'm glad it was evident to you that my heart really went into this hub. What an amazing Hub! So much more than just food, but the stories and history behind it. habee, this is indeed a real labor of love hub if there ever was one. I thought it was just going to be on Gullah-Geechee food. You write on your families long roots in the low-country area of Charleston with heart and honesty along with the accompanying great pics. You've explained who the Gullah people were and their wonderful recipes. The Gullah related terms- and vids complete this extraordinary article. Congratulations on a quintessential Hub! Boomernurse, your kind comment really means a lot to me! Writing this was a real labor of love! This hub is truly unique and shows how the use of videos and practical hands on information can greatly enhance a reader's experience! I have bookmarked it as a favorite and will definitely be coming back to it. My husband and I first learned about the Gullah culture when we visited Charleston and the surrounding plantations. Since then we've been able to attend a Gullah Festival on Hilton Head Island, visit Daufuskie Island, Beaufort, SC and some of the Georgia coast islands. But I've never seen so much information presented in such a helpful, interesting way as you've done here. Thanks for sharing your extensive knowledge and some of your family history. This hub is a cultural treasure! Editor, I'm so happy that you read and commented! Saleheen, thanks for stopping by, and for your kind words! Interesting hub on the history and cuisine of special group of the slave trade. I am of caribbean heritage and a lot of the foods you mention I recognise as they were a part of my culinary childhood from my mother and grandmother. Lareerie, that's great! The more people who learn about the Gullahs, the better! Wow! Thanks, Patty! I love my red and white splatterware, but it's hard to find. Wanted to come back and congratulate you on winning, but this hub is so outstanding and far above what I would have expected from a hub that you deserve every penny. This Hub contains more information than the documentary I viewed about Gullahs on an island off South Carolina's coast! I especially enjoy the vid about boiled peanuts, because now I know that I did not have to shell them all before eating them a few years ago. The tableware you use is also as attractive as the food you serve. Elayne, many thanks! I'm sure it was a tough decision for the judges. Wow - that was amazing and congrats on your winning hub. You deserved it. Very interesting and informative. Anne, I'm so glad you enjoyed learning more about the Gullah culture! Rose, glad you enjoyed my labor of love! Wow Habee, this is an absolutely awesome hub! I learned so much from reading it, and it's so very fascinating. You should write a book. It would be great because the reader can tell your heart and soul is in it, not just information. Your heritage connection really makes it all come alive. Fabulous job! Thanks, Judy! Glad you stopped by! I enjoyed reading this hub thanks. Congratulations, girl, on winning the best Hub of the week. You really deserved it on this one! Thank you so much, Maita. You're always such a sweetie! Randy, remind me to tell you what Mel said about you and me! See! Toldjaso! Nuh, nuh, nuh! Thanks, Queen! Glad you stopped by! Deb, I sometimes dream of having a cooking show, or maybe a restaurant. Sometimes I feel like my home is a restaurant! Glad you enjoyed the read, and thanks for visiting! Congrats, though I knew already, just from reading your hub. So in awe of u! Wow! I learned a lot about the Gullahs! 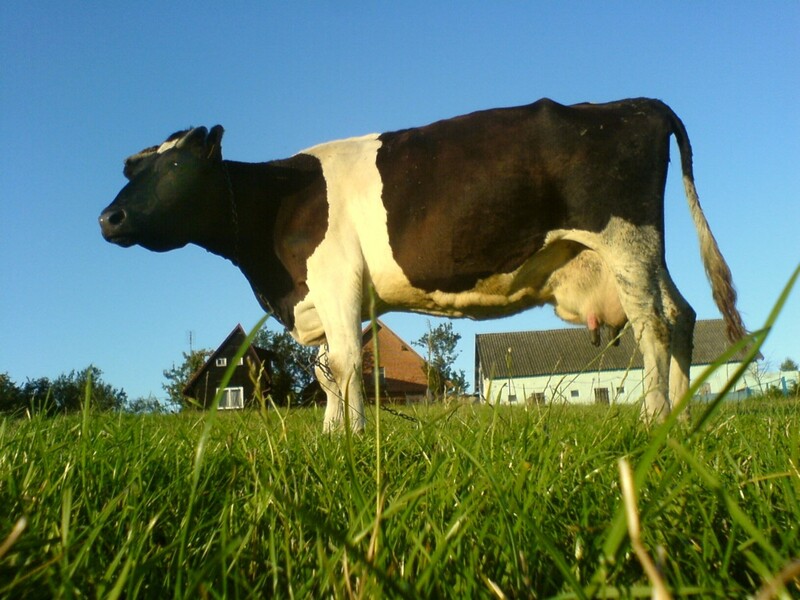 I got nostalgic 'coz I recalled our cow when we're still living in the country. Thank you for sharing sumptuous information about a colorful culture and cuisine from a different world. Congratulations, too! Habee, WOW! Wonderful thorough job! You have a multiplicity of things to learn and enjoy here!!! Cooking, videos & history what a wonderful job you have done! Great assortment one must camp here more than a few moments to reap the benefits! I know without tasting you are a Great cook! You certainly are a Wonderful person! I told you before you could do a "Cooking Show" and yes a Cookbook too! As they say "You go girl!" No doubt that you put a great deal of love, sentiment and work into this hub! You certainly are gifted in this area! Great Job! HubCrafter, your comments have made my day! I really spent a lot of time and effort with this hub, and I'm so glad to know that it's so appreciated and enjoyed by others here. Thank you! Just finished this wonderful hub. After reading thru the comments I see you've already started on (what I thought was going to be an original idea)..turning this hub into a book! Great idea, girl! Please be sure to include as many stories about family recollections as possible. The first-person stuff really makes it come to life. This is such an admirable piece of writing...I just know you'll fill your book with all the heart and joy we've experienced here. Thanks so much for sharing this slice of Americana with us! KoffeeKlatch, I very much appreciate your kind comments! And feel free to use the hub with your classes. Did the hub sound like it was written by a retired teacher?? lol. That's me! Audrey, I just saw that. Thanks a bunch for your continued support and for being my pal! Awesome hu - the videos, writing, pictures, descriptions, everything. I agree with bayoulady, you really should use this as a book query. I bookmarked so I could use the information for my class, this information will be perfect for them to use for a project coming up in January. Congratulations of course on the nomination but congrats on being the featured hub!! Money Glitch, I imagine many of the same customs were observed by all slaves from West and Central Africa, and TN had slaves. Of course, as I mentioned, the original Gullahs also learned some techniques from Native Americans. Glad you enjoyed it, and thanks for visiting! Wow what a wonderful tribute to the Gullahs. Found it very interesting reading especially because many of the techniques of curing and storing potatoes, ham, etc. are the same techniques that were used when I grew up on a farm in Tennessee. Maita, you are beautiful and awesome! I appreciate your kind comment! Doc, I'ma thinkin' iffin you drive that fer from Canady, you all will be a wantin' more than jist swimp n grits. How bout some crab stew, biled goobers, watermillion, and sweet tada pie, too? Glad you stopped by. This food is really awesome! Prasetio, you know me well - I do have a passion for writing. I also have a passion for food and history, so this hub was the perfect fit for me. Thanks! I'll be over for suppuh for some swimp ‘n’ grits! RD, maybe you guys can go this summer so we can hit the sheepshead in the fall. I learn much from this hub. You always totally to create a beautiful hub. That's why your passion in writing was never end. I really enjoy this information. It open my eyes about various cuisine from over the world. Good work, my friend. I rate this Up. Kewl, Peggy! Come on over - I'll set an extra place at the table! Don't know when we are going to Jamaica yet! Waiting on Josh and Brook to arrange their work leave! Congratulations on the nomination. This is a terrific history lesson combined with all of the recipes. Your heart and soul went into this hub. Tell you what...I am ready and willing to eat at your home anytime!!! Hi, Ray! Yeah, it's amonst a novella, huh? lol. I'm just in love with the subject! Glad you stopped by! Lakeerie, The Gulluh people are really fascinating. Here in the Deep South, we still use many African/Gullah/Geechee words. One of the most popular is "tote" - as a verb. Thanks for reading! RD, when are you guys going to Jamaica?? This is an amazing article, and I have only skimmed it so far. I learned a bit about the Gullahs when I took a history of the English language class in college, and it was fascinating. I really need to dig in to your hub. Just incredible. Sounds good to me! We can go on your contest winnings! Wow, RD - that's high praise coming from you! I agree with you; I think this is the best hub I've EVER written. I'm ready for some castnetting, too! Maybe we can plan a trip for Sept or Oct? You and Beth would LOVE Anna Maria! This is my favorite of your articles, Holle! Not that I've read all 600+ of them, but I think it is the best. If the judges do not like this one, then their ability to choose correctly is in doubt. I'm ready to go cast netting for sheephead, so let's go before long! Bekah, I hate what the oil is doing to their way of life. It breaks my heart when I hear that the marshes might never recover. Now we're hearing it might go all the way around the tip of FL and invade GA and SC. If so, the Gullah people will be greatly affected, also. I love tidal marshes. They're delicate ecosystems, home to a huge number of critters. Many fish species use them as "nurseries." I hope Earth can eventually heal herself because mankind isn't doing a very good job of it. Om, I'm glad the hub interested you and piqued your appetite! I love your food hubs, as well. Thanks for reading! it was an amazing year I spent there Hollie. One of the guys took us to this shack type restaurant near the swamps. I remember there was a bridge near-by and we sat out on the wooden deck. the cajun spices are a little different from creole, but it was the most amazing food I've ever tasted. the people were so heart-warming. it's sad to think their way of life is now in jeopardy. driving on the road through the swamps was an image and experience I'll never forget!! we even camped out one weekend north of Lake Pontchartrain and brewed real cajun coffee! I left that place with a slight French Acadian accent!! great memories, maybe I should hub about it. you've stirred up some warm memories with your work here. thanks!! I think I'll cook creole style tonight! Wow! I mean....WOW!!! There's a huge amount of interesting information in this well-written hub. Also, it has made me very hungry. Thumbs up! Oh my word, habee ! You've really gone all out on this one. GREAT content and fascinating. Can I come to your house for dinner? Bekah, those are the best kinds of restaurants! I'm glad you got to experience that culture and food. The Acadians (Cajuns) also had an influence on the Gullahs - or maybe it was the other way around! lol. Thanks! W, so kind of you to vote my hub up! Thanks a bunch! 50, I'm sending you an email! Flight, I almost mentioned Justice Thomas in the hub. Glad you made the connection! You'll love Savannah! I used to live near there, and I went often. Thanks for visiting! Irohner, so nice of you to take the time to read this lengthy article and comment. Thanks! You weren't kidding when you said it was a long hub! That doesn't matter though, because it's chock full of fascinating information and terrific videos and pictures. Great hub, Holle! Voting for it! Sally, your kind words are much appreciated! Glad you understood my "tense" predicament - the English teacher in me coming out. lol. I'm actually working on a book based on my family history, and much of the Gullah history is included. Loren, I love history AND food, so this hub was right up my proverbial alley! Thanks for reading! Ernest, I'm honored that you came for a visit! You'd love the Gullah "soul food." If you ever make it over this way, please come have dinner with us! Hollie, I saw this title and had to come in and read! what an amazing piece of work you have compiled. I can tell your heart is in this hub. I haven't watched all of the videos yet, but am bookmarking for later. I lived in New Orleans for one year during a college internship and fell in love with the entire area and culture. one of my friends cooked like this and was a true Cajun showing us the 'off the beaten path' restaurants to find this food. the history you have compiled is certainly book or major magazine article worthy!! clicked everything! Mark Knowles?! Damn! This must be a good hub! lol. I just called Randy Godwin to tell him that Mark Knowles visited and commented positively on my hub, and he said that was the HP "Mark of approval." I have arrived! Thanks, Mark, for taking the time to read and comment! Terrific hub, habee! Where's that "vote up" button? Oh yeah, right above the comments! Going there now. Travel man, thanks so much for your vote of confidence! Glad you enjoyed the hub! Hi Habee! After seeing your topic among my list, I knew I had to read it. I first got interest in the Gullah people and culture when I read Justice Thomas Clarence's memoir, My Grandfather's Son. I thought what a strong people. Then when I visited Charleston, I found out how strong the connection is between traditional lowcountry cooking and the Gullah cooking, I was even more hooked. Southern food is so amazingly good. I plan to take a trip to Savannah soon and indulge and even learn more. Reading your hub made me want to take another trip to Charleston. Thank you! Ditto what Sally's Trove said. You write the book and I'll definitely buy it. Great hub! I felt as though I were traveling with you, through the history and through your memories, spending the day experiencing another way of life. There are many historical re-enactment centers and venues in the US (three that come to mind are Colonial Williamsburg, Bedford PA, and Salem WV) that provide a living experience of colonial life; is there a similar Gullah experience? The Skin Quilt Project video and vocabulary list are welcomed additions to grasping a sense of the many influences that shape this cuisine. I recognize the challenge of tense you faced, which you resolved into a seamless writing, which became a seamless reading. Should you turn this beautiful study into a book, I'll be buying several copies!